Left to right: Marius Von Frankenhorst and Lourdes Santana interns at CIAT, Omaraly Blanco CIAT International Taxation Coordinator and Juan F. Redondo Head of the Spanish Mission at CIAT. 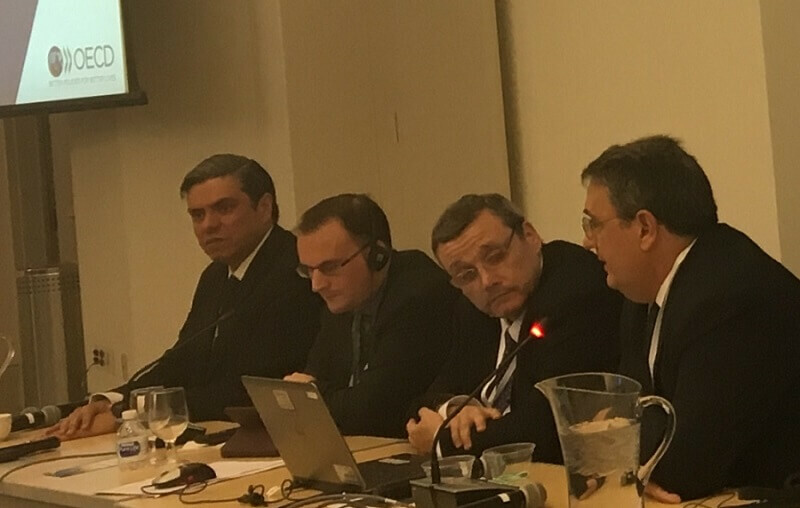 T.
Last December 10 and 11, 2018 in the Andres Bello Hall of the Inter-American Development Bank Headquarters (IDB) located in Washington DC, a meeting was held to analyze the implementation of BEPS Action Plan in Latin America and the Caribbean titled “Implementing BEPS: Minimum Standards and the Digitalisation of the Economy”. 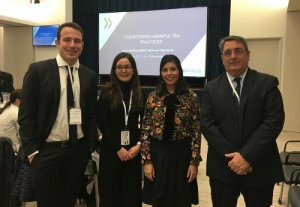 The event, organized jointly by OECD, the World Bank, IDB and CIAT, was attended by representatives of different countries and international organizations. Critical issues were addressed for the Inclusive Framework of BEPS, such as the Country-by-Country Report (CbCr) analysis, and the study of harmful tax practices, among others. This is another example of the exchange of experiences and collaboration essential to achieve an increasingly inclusive implementation of BEPS. Likewise, the presentations on the Value Added Tax (VAT) taxation of the digital economy stood out, a matter that constitutes an important challenge in the immediate future for the tax administrations of the region and that requires the utmost attention and analysis. All member countries "Economics E-Journal" Angola Argentina Aruba ATAF ATAIC Barbados Belize Bermudas Bolivia Brazil CA Canada CATA CBF CCobranza CCodigo CeFactura CET CETSF CHabilidades Chile CHPST CIAT CII CIOF Colombia Costa Rica COTA CPT CREDAF CRH Cuba Curacao DAT Dominican Republic DPTT DT Ecuador El Salvado El Salvador España Costa Rica Beps OCDE AEAT Uruguay EUROsociAL Estados Unidos Foreing Trade and Customs France Guatemala Guyana Haiti Honduras Human Resources ICT India Italy Jamaica Kenya Mexico MHPAT Morocco MTICEA Netherlands Nicaragua Nigeria NTO ONAT Panama Paraguay Paraguay. Educación PAuditores Peru PITAA Portugal Santiago Serralde Sint Maarten Spain Suriname Tax Administration Tax Law Tax Policie and Technique Trainers network Tributación Internacional Trinidad and Tobago Uruguay USA Venezuela WATAF.